The following is an excerpt from the book Save Gas, Save the Planet. Copyright ©John Addison. All rights reserved. Environmentally concerned car buyers worry that that switching to an electric vehicle does not help. They are concerned that instead of using one fossil fuel, petroleum, another will be used, coal. Many electric vehicles are three times more efficient than vehicles that run on gasoline. Mitsubishi Motors, an early leader in electric vehicles, estimates EV efficiency at 67 percent instead of 30 percent for a hybrid-electric and 15 percent for a normal gasoline vehicle. Electric vehicles are more efficient for many reasons including the efficiency of electric motors. As an added bonus, electric vehicles can be lighter, using accessories that run on electricity not mechanical links to the drive system. Regenerative braking helps. Weight can be distributed more effectively in a vehicle. Best of all, the fuel can be local renewable energy not gasoline processed from foreign oil. Electricity is cheap compared with fuel from oil. Lifecycle analysis using the coal-dominate United States energy mix shows less total greenhouse gas emissions from a battery electric vehicle than a comparable gasoline vehicle or even a hybrid. A good place to look at lifecycle comparisons is the Argonne National Laboratory, which publishes comparative studies and offers an extensive GREET spreadsheet tool for any organization to use. Electric vehicle lifecycle emissions will usually be lower than the coal model. Over 25,000 of the first 40,000 electric vehicles sold in the United States are in California, where electric utilities are legally required to use a growing mix of renewable energy. Under a study commissioned by the California Air Resources Board, the Low Carbon Fuel Standard Technical Analysis showed that a unit of energy from California’s typical electric mix caused 27 grams of CO2 equivalent; from gasoline, 92 grams. In reality EV emissions are still lower because many people are charging their vehicles at night when electricity would otherwise be wasted. Nighttime charging will increase as electric utilities install smart-meters that can be programmed to charge vehicles when rates are lowest. Nighttime rates are often only one-third of peak rates. 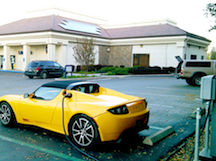 Many buyers of electric vehicles also buy renewable energy credits or use solar power for charging. While electricity is getting progressively cleaner as states mandate increased use of renewables, incremental gasoline is produced from sources with increasing greenhouse gases such as tar sands, coal to liquid, and the contemplated nightmare of oil from shale. Get your discounted paperback or eBook copy of Save Gas, Save the Planet at Amazon. Gain a comprehensive understanding of electric cars, low-carbon fuels, and sustainable transportation. ← Electric Car -How Does It Work? In my part, if I gonna chose what my car should be using, I prefer the electric vehicle. We all know what are those health hazards that gasoline will bring. So, EV have more advantages compared with the used of coal or gasoline. Anyway, thank you for sharing.